We’re back with another fresh round up of the latest coin collecting news and articles from around the internet! The 2012-W Uncirculated $50 Gold Eagle has unexpectedly sold out at the US Mint. This will likely establish a new mintage low for the American Gold Eagle program. More news related to the US Mint: Many numismatic products have been added to a “Last Chance” section, with sales scheduled to conclude before the end of the year. Circulating coin production exceeded 1 billion for the month of October, representing the highest monthly total in several years. An article on CoinWeek describes five aspects that make collections great. Collectors Universe, the parent company of PCGS, reported their financial results for the first fiscal quarter. Coin service revenues declined by 19%. Here is a transcript of the earnings call, which provides some more color on the results. Here are some highlights from the upcoming Heritage auction held in conjunction with the Money Show of the Southwest, including an 1895 Morgan Dollar graded PCGS Proof 66 Cameo. A collection of space-flown silver medals owned by an Apollo astronaut will be offered at auction. A new video has been posted on the United States Mint’s YouTube channel, which describes the history of the US Mint and BEP. Collectors looking to collect something odd might consider the silver 3-cent piece. Doug Winter provides some suggestions for how to collect Dahlonega Gold Coins. 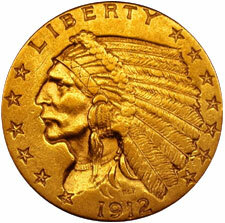 Jeff Garrett provides an analysis by date for the Indian Head Quarter Eagles from 1908 to 1929. The Royal Mint Blog comments on the new specifications for the 2013 Gold and Silver Britannia coins and includes an image of the new packaging. A homeowner in San Antonio used 9,700 pennies to tile her bathroom floor. The latest article within a series covering early silver commemorative coins takes focus on the 1924 Huguenot Half Dollar. And now for some notable auctions. First, here are the current listings for the recently sold out 2012-W Uncirculated $50 Gold Eagle. Next, here is a nice looking collection of 1971-1978 BU & Proof Eisenhower Dollars displayed in a Capitol Plastics holder. That’s it for another update. Have a great weekend!